The Braves acquired left-handed pitcher Chris Jones from the Indians in exchange for Derek Lowe and cash. There's no surprise here, except for the fact that the Braves were actually able to trade Lowe. The Indians are also taking $10 million of the $15 million that the Braves still owe Lowe. That's nice chunk of cash to free up. Jones went 7-1 pitching A ball last season. I think there's still some gas left in Derek's tank. Not a lot. Just a teeny bit. He had a very rough 2011 and his last start as a Brave was horrific. I hadn't totally given up on him this season. Remember, 2010 started off bumpy for Derek but then he ended up being the Braves best pitcher after the All Star break. He was lights out in September. So this season, I gave him the benefit of the doubt. Derek didn't come through. The Braves also exercised their option on Eric Hinske and declined their option on Nate McClouth. Again, no surprises here. And so it must be true. Tony LaRussa is retiring. Not to sound cliche, but that came straight out of left field. I hadn't heard even the slightest of rumblings about the possibility of LaRussa hanging up his spikes. Admittedly, I don't have my finger on the pulse of the Cardinals organization but I do have many friends who are extremely loyal and passionate Cardinals fans. I'm certain they are in a state of shock and disbelief right now. Management knew Tony's thoughts in August but his coaching staff and players found out Sunday, after the World Series victory parade. What a buzz kill. LaRussa is going out the way everyone wants to. On top. Off the top of my head I can only think of one other person who's done the same. Jerome Bettis. Perhaps y'all can remind me of others. I don't want this to read like a news report because that's not what I do, but some of LaRussa's accomplishments are worthy of repeating. A 33 year career, the last 16 spent as manager of the Cardinals made Tony LaRussa the longest tenured manager this season. LaRussa is the 3rd winningest manager in the history of baseball behind Connie Mack and John McGraw. Bobby Cox is fourth on the list. Only Connie Mack has managed more games than LaRussa. Mack retired at the age of 87. LaRussa is 67. LaRussa led teams have won 6 Pennants and 3 World Series. LaRussa has been named Manager Of The Year 4 times, twice in each league. LaRussa needs only 36 wins to pass McGraw on the all-time wins list. At his press conference he was asked if he considered staying one more season so that he could surpass McGraw. I love his answer. "I'm aware of the history of the game," LaRussa said. "But I would not be happy with myself if the reason I came back was to move up one spot. That's not why you manage ... it's not something that motivates me. Wherever you finish, you finish." I'll be honest with you. I am not the hugest Tony LaRussa fan. I do have a great appreciation and respect for what he has accomplished over his career. He has a brilliant baseball mind and his numbers speak for themselves. What I haven't always liked what he's said in the the press about other managers and teams. Very often he comes across as whiney and petty. He's very taciturn and often seems arrogant. That's something I don't care for. Then again, his players and coaches love him and it seems they'll do just about anything for him. This season, we even saw them rise from the dead for him. LaRussa also does a great deal for charity, especially animal charities, which I totally love. Here are the real questions. There are now two, more than likely three, prime managerial positions open. St. Louis, Boston and probably Chicago. Who will go where? Yesterday morning, re-signing Albert Pujols was the first order of business for the Cardinals. Now they need a manager too. My thinking was that with the World Series crown there was absolutely no way that the Cards could let Albert go anywhere else. With LaRussa gone, it's even more vital to keep Albert in St. Louis. Will Bill DeWitt and John Mozeliak go after Terry Francona? Or does Theo Epstein want him in Chicago? I don't even know the state of that relationship right now. We know one thing, Theo is aggressive. Does Theo want both Terry and Albert? The Cubs are always willing to spend. If Albert goes to Chicago, does Prince end up in St. Louis? Or is it Terry and Prince in Chicago? Help me out. Where do you think all the pieces will fall? What do you think about Tony LaRussa's retirement? Did you see it coming? And who else retired at the top of their game? Oh yes, and Happy Halloween! I love autumn. It's my favorite season for so many reasons. The summer heat is finally waning, the leaves begin to turn, post season baseball arrives, it's great hiking weather and...Halloween! Halloween has always been my favorite holiday. I love everything about it and everything that goes with it. I decorate for Halloween (more than I do for Christmas) I send out Halloween cards and to a few special people, gifts. A few Halloweens ago, I sent a book to a 6th grader who has never liked to read. 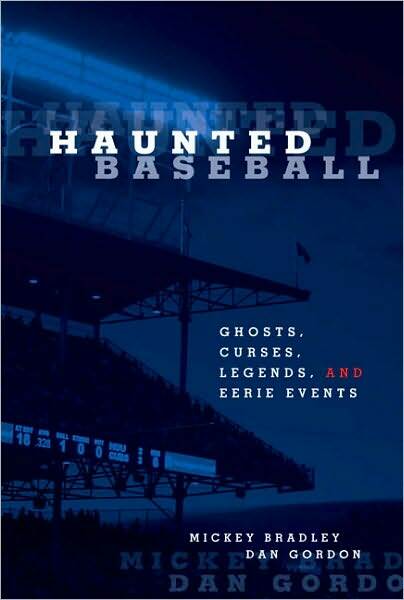 It was titled Haunted Baseball. I had the hope that his love of baseball and Halloween would get him reading. I don't think he ever finished the book, but I LOVED IT! Yes, I read it before I wrapped it. The stories told are from people involved in all aspects of the game, players, umpires and front office personnel. From the hidden passageways at Dodger Stadium, to a haunted spring training complex in Florida to the legendary ghosts who wouldn't leave the old Yankee Stadium these stories will pull you in. Who has experienced these hauntings? Jim Thome, Johnny Damon, Ken Griffey, Jr. and Roberto Clemente all have hair-raising stories to tell! 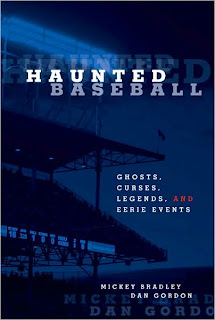 Haunted Baseball is a fun and easy read and perfect for this time of year! I don't think anyone would disagree that baseball fans were treated to one of the most exciting, competitive and compelling post seasons in baseball history. The two wild card teams weren't decided until the witching hour on the last day of the regular season. In fact, we almost got one extra day of regular season play. Of the 41 playoff games that could have been played, 38 were. The majority of those games were close and the mostly unlikely and unexpected of post season participants took home the Commissioner's Trophy last night. Wow! Congratulations to the St. Louis Cardinals!! Even the most loyal of Cardinal fans had to think that their team didn't have a snowball's chance of making the post season, let alone going the distance. Spring training began with their best pitcher, Adam Wainwright having Tommy John surgery. The team played ok, but not well enough. As we've heard countless times, on August 25th, the team was 10 1/2 games back in the Wild Card race. Forgive me if I can't bear to mention who they surpassed in that race. They were a team not playing like Cardinals teams are suppose to and they knew it. The front office made the right trades at the right time. The team got it together and got hot when it mattered. And they never cooled off. There are two players I am especially happy for. Arthur Rhodes and Lance Berkman. Arthur Rhodes is 42 years old and this was his first World Series. He's played for 9 teams in his 20 year career and last year he played in his first All Star Game. Every time Arthur takes the mound, before he throws his first pitch, he scratches the initials 'JR' on the back of the mound. 'JR' stands for Jordan Rhodes, Arthur's son. Jordan passed away in 2008. He was only 5 years old. Arthur is a private and stoic man. He never spoke of his son's illness or death. Arthur Rhodes keeps playing baseball to honor his son's memory. Lance Berkman has been in the bigs for 13 seasons. I have a love/hate relationship with him. That comes from his 11 seasons with the Astros. He ALWAYS had the Braves number. Lance is a gamer and I love to watch him play. He's a throwback player and he always plays one way, hard. He's played in one World Series, 2005 when the Astros were swept by the White Sox. Lance was traded to the Yankees in the middle of last season as the Astros were trying to free up money and build for the future. (Don't they always seem to be doing that?) He signed with Cardinals as a free agent in the off season and, ironically, was almost traded to the Rangers this year. He told the Cardinals brass that he understood if they needed to trade him but he wanted to come back to St. Louis at some point. Instead of trading him they signed him for 2012 too. That was a good move. Some baseball players wait a lifetime and never get to play in a World Series. Some players go early in their career and never get to go back. And some players, like Arthur Rhodes and Lance Berkman play their hearts out season after season and get a World Series ring in the twilight of their careers. Even Rangers fans have to be happy for them. My heart is still pounding! I can't believe the Game 6 we were treated to last night! It was baseball at it's finest, not always well executed, but still a heart stopping game. Heart wrenching if you're a Rangers fan. Not once, but twice, the Rangers were one out away from the teams first World Series title. Not once, but twice, the Cardinals tied it up. Then the local boy hit a walk-off home run. The boy who quit playing baseball after high school. They simply won't go away quietly. The Cardinals almost seem to be a team of destiny, given up for dead in late August and now one win away from the team's 11th World Series title. But what about the Rangers and destiny? Winning tonight would make it even sweeter than winning last night. More stressful, but much sweeter. Not one player on the Rangers roster has a World Series ring. Not a one. That's pretty amazing considering the mobility of baseball players today. Wouldn't it be wonderful for Michael Young to be a World Series champion? 11 years with the Rangers. He's done everything the team has ever asked of him. He is Mr. Ranger. Josh Hamilton, baseball's ultimate story of redemption. Having it all, losing it all, and working so hard to get it all back. Nolan Ryan, fighting for the team and rebuilding it from the deepest part of his baseball-shaped heart. Every team has their stories but some in Arlington are nothing short of poetic. What's it like to be a baseball player in the promised land of football? For the past few years the Rangers have been a much better team and organization than the Dallas Cowboys. But they still play second fiddle to America's Team. The Stars, the Spurs, the Mavericks. They all have Championships. It's time for the Rangers to join the club. The Cardinals have been around for 111 years. The Rangers 40, 51 if you count the years as the Washington Senators. Three teams younger than the Rangers have won the World Series. The Blue Jays twice, the Marlins twice, the Diamondbacks once. That has to smart if you're a Ranger. So which team is the team of destiny? Maybe that's what Tony LaRussa should have said when Derek Lilliquist answered the bullpen phone. It's been nothing short of bizarre, keeping up with this ever changing story. Yesterday I read, listened and watched so many different reports on what happened and the subsequent commentary on what now has been dubbed "Bullpen Gate". What I find strange is how these stories have evolved with each passing hour. There are so many inconsistencies and so much finger pointing. I don't get it. From Lilliquist getting the wrong pitchers up, to LaRussa not remembering if he or Dave Duncan called the bullpen to the just as intriguing storyline of whether LaRussa or Albert Pujols called for a hit and run, where does the truth lie? Not that any of that is important now, the Cardinals lost Game 5 and that's all that really matters. And while the Cards deal with the circus, the Rangers are quietly and solely focused on Game 6. What do I find the most humor in? That all the analysts are shocked that the great Tony LaRussa may have made a mistake. As the kids say, OMG! Don't get me wrong, LaRussa is an incredibly smart man and he has a great baseball mind. But that doesn't make him infallible. One analyst on the MLB Network even made reference to LaRussa's age. So now they think he's senile!?! To me, it looks like the man made some mistakes during the game. It's that simple. Oh, and maybe he doesn't want to take all the heat. I'm curious about a comment from today's press conference. But isn't that what he kind of did to Lilliquist, Duncan and Pujols? From two pitching duals to nothing short of a pure slugfest, Game 3 of the World Series was a complete turnaround from Games 1 and 2. And Albert Pujols proved once again why he is the most feared hitter in baseball. Three home runs in one game. 5-6 at the plate. 6 RBIs. What left many of those in Arlington jaw dropped last night is what Cardinals players and fans have come to expect. Albert was hitless in Games 1 and 2. 0-6 with a walk. Simply put, Albert was due. Perhaps overdue. In Game 3, Albert caught up. He now keeps company with Babe Ruth and Reggie Jackson and it all seems so very right. Albert took a little bit of heat for not speaking to the press after Thursday's loss. He said he waited 25 minutes but no one approached him in the locker room. Maybe the reporters were scared? The travel day gave Albert extra time to think or perhaps dwell on the first two games. Some players can struggle through an entire post season (Alex Rodriguez) I don't see how that is humanly possible for Albert Pujols. He is that good. He may have a few sub-par games at the plate but Albert gets himself back on track more quickly than any other player in the game. His legend is growing right before our very eyes. Do you realize how lucky you are to witness to this? Tonight, Game 4, I expect to see Albert walked more than once. Honestly, can you blame the Rangers? Very few baseball players spend their entire career with one team. Everybody loves the storied careers of lifers like Mr. Cub, Ernie Banks and Cal Ripken Jr., a forever Oriole. Perhaps we're seeing a few of those players now. Chipper Jones, Derek Jeter, Todd Helton and Michael Young have all spent their careers with one ball club. Some players, even though they're so strongly associated with one team, have played for another. Babe Ruth, Hank Aaron and Ozzy Smith all spent time elsewhere, although sometimes it's hard to remember where. For many loyal fans, it's hard to even imagine one of our favorite players in any other uniform, but it's a harsh and ugly reality we sometimes have to face. It broke my heart to see Tom Glavine in that Mets uniform and I never got use to it. Next season, we may think how odd Prince Fielder and Albert Pujols look. Or perhaps they'll look exactly the same. Only time will tell. Baseball players change teams for a myriad of reasons. Sometimes it's their choice, many times not. Free agency, trades, waivers or signing a player who's been cut loose. You never know when or where a player will resurface. Throughout the post season I've seen so many familiar faces. Players that were once an Atlanta Brave are on other teams now. Some came up through the farm system and others via a different avenue. Some were here for awhile. Others, just for a cup of coffee. Let me know if I missed anyone. One of my favorite moments at any sporting event is the singing of "The Star Spangled Banner". We don't have the opportunity to sing our National Anthem very often and as far as national anthems go, it totally rocks! It's not an easy song to sing and we've seen and heard it butchered many a time. But those who have done it right, they've given us goose bumps and we've never forgotten it. 1991. Super Bowl XXV. Whitney Houston. Need I say more? Game One of the 107th World Series is upon us. Me, being a music person, I'm curious as to who our performers will be. The Super Bowl has one performer. The World Series has up to seven. Here is my issue. Over the past few years, as Fox has been broadcasting our biggest sporting events, singers from other Fox television programs (i.e. "American Idol" & "Glee") have cornered the performance market. I don't like it. Don't get me wrong, Carrie Underwood does a fantastic job. Others not so much. This year, I'm certain we'll see dude who won American Idol last season. What's next, a dance interpretation from the winner of "So You Think You Can Dance"? That's one of the things that I like so much about the two League Championship Series. The singers/musicians who perform our National Anthem have a connection to the city, not the network. How cool was it to see Aretha Franklin and the Four Tops singing in Detroit? And the Silver Bullet Band's Alto Reed performing on the sax. Stellar! In Arlington we saw Fourtwelve and Jack Ingram. Chuck Berry performed in St. Louis and Milwaukee called upon three un-famous but very talented local artists. It came across so much more meaningful. The World Series is a national event but it still has a very local vibe to it. There is always a team connection to the person who is given the honor of throwing out the ceremonial first pitch. It should be the same way for the musician(s) who perform our National Anthem. And before y'all harass me, yes I know his name is Scotty McCreery and he is from North Carolina. The Brewers made an exit just as ugly as the Tigers. Two very lopsided Game 6s. I wanted to see better games. I expected more. And as I said previously, I hate to see any team go out that way, especially in this case for Prince Fielder and Brewers fans. If we hopped into the time machine and went back to mid-season, tons of folks would have said that the Rangers would make it to the World Series. The Cardinals, not too many. And yes, I'm including Cardinals fans in that poll. As for the World Series, public sentiment will be with the Rangers. The red-headed stepchild of Dallas. I love it when people do the right thing. Last night that person was Albert Pujols. Recognizing that Prince Fielder may be taking his last at bat in Milwaukee as a Brewer, he called for time just before the first pitch. Brewers fans were able to continue cheering for one of their most beloved. It was something that Prince richly deserved. Albert's moved showed class and respect. I tip my cap to both of you. Congrats to the Rangers for making it back to the World Series! It speaks volumes about the players, coaching staff and front office for making it back. That's no easy task. I'm sure many thought the Rangers were doomed after losing Cliff Lee but this team is stacked. They're firing on all cylinders and they'll be tough for anyone to beat. I do feel really, really bad for the Tigers and the shellacking they took last night. I'll be honest, I could barely watch it. Luckily, I was multi-tasking with my main focus on the Georgia/Vandy game. As an aside, I love my Dawgs and in my world there is no football like SEC football. When I'm not bleeding Braves blue, I'm bleeding Georgia red and black. Back to last night. After the Dawgs squeaked out the win, the ALCS got my full attention. At that point, the game was so out of reach for the Tigers. Ugly is the only word to describe it and no one wants to go out that way. The Tigers are a great team, they're building the right way and they'll be back in the mix next season. I am a HUGE fan of Jim Leyland. It seems like he's been around for forever and I'm guessing that's because he was a National League guy for so long and I saw him so often. I can still see him in that Pirates uni, smoking in the dugout. It makes me laugh to think that was ok! The Braves and the Pirates played some tough games in the early 90's. Talk about a stacked team...Bonds, Bonilla, Drabek, Van Slyke, Neagle and a young Tim Wakefield. I still get chills when I see Sid Bream and the slide that got the Braves back into the World Series in 1992! And Jim evened the score with the Braves when he led the Marlins to a World Series victory in 1997. He's the best thing that's happened to the Tigers in the last 20 years. He's a classy guy and he showed nothing but in his post game comments last night. I know someone has to lose, but I hate it when it's someone who's so deserving and someone who's given so much to the game. Baseball fans witnessed two epic collapses at the end of this regular season. One in Atlanta. One in Boston. From my Braves fan point of view, it was like watching a slow motion train wreck. Honestly, I truly believed the Braves were going to pull it out at the end. The Braves love to torture us and I knew that it was going to come down to the last game of the regular season, just like last year. I knew that the Braves would make the post season as the wild card. In all my Pollyanna-ness I knew Atlanta would see October baseball again. Nope. At the end of that game on September 28th I stood there in disbelief, watching my team walk silently into the sunset of the 2011 season. The Braves acted swiftly. Hitting coach Larry Parrish was dismissed. President John Schuerholz sent what is best described as a letter of apology to Braves Season Ticket holders. The local media was the toughest they've ever been on Fredi Gonzalez and the failings of individual players were openly dissected. But that is NOTHING compared to what is going on in Boston! Terry's gone. Theo's gone. Am I watching sports reporting or some baseball version of the Real Housewives!?! I won't even bother to laundry list the names of Red Sox legends who are rolling over in their collective graves. Terry Francona has gone from being the savior who broke The Curse to what various news sources are portraying as a pill-popping, hotel-dwelling, head case. Certain superstar pitchers, were reportedly drinking beer, eating and playing video games while their teammates were on the field. There are reports of players whining about a day/night double header due to Hurricane Irene and then ownership appeasing the players with a gift of pricey headphones and a party on owner John Henry's yacht. The Red Sox are airing their dirty laundry and it's getting uglier and uglier. What's left of upper management seems to be in disarray and the players are looking like what we don't want them to be...spoiled millionaires. Red Sox. What has become of you? For the past decade you were the shining model of how to build a championship team. It was the ultimate comeback story 86 years in the making. And just to prove it wasn't a fluke, you did it twice. Now, it's a circus, a soap opera, an embarrassment to your Red Sox Nation. So then it makes sense, being that I'm a baseball fan, that I'm a bit superstitious too. A few years ago I was having a conversation with my boss. I made the comment that I didn't want to jinx something. He shook his head and said to me, "You baseball people, jeez." This past season, an opposing pitcher (I can't remember who) was no-hitting the Braves. I called a friend who was at the game and told her to switch seats with whoever she was with. They did. No hitter gone. It sounds crazy, but it worked. Last night I was watching the Rangers/Tigers game. The Rangers were up 2 games to none. The series was back in Detroit and I'm thinking about all my Tiger-loving family members in Michigan. They're probably getting a little bit nervous at this point. No one wants to be down 0-3 They're all great fans and I feel their anxiety. The Rangers are up 1-0 early in the game when I go into the kitchen for a glass of sweet tea. I return, the game is 1-1. I'm not sure what happened as I can't hear the tv from the kitchen. An inning or so later, I go back into the kitchen for a snack. Upon my quick return it's 2-1 Tigers. Now, while I'm watching the game, the Tigers look ok, but not great. They're pretty banged up and there's no disguising it. A little bit later I need a refill. I swear, when I return to the living room, 3-1 Tigers. At this point I know what I have to do for my family. I change the channel. "Parenthood". It's a cute show with a good cast. I'm sure a lot people can relate to it. But I'm still curious about the game. 10:19 I flip over to check the score. 4-1 Tigers. 10:28 I check back. 5-1 Tigers. The final score ended up being 5-2. I'm not saying the win was because of me, but I did what I could for my family. So you think the playoff viewing schedule is perfect, one game following another. No problem, right? And then...FREE BASEBALL!! I stayed with the ALCS game and my Lord, what a finish! Ron Washington said it before the game, "Nelson Cruz has the ability to carry this team." Manager, prophet, soothsayer. And with all the years of playoff baseball, I can't believe that no one has every hit a walk off grand slam in the post season. Crazy! Now that I'm up and running I have to jump back to the NLDS and the ALDS. There were two outcomes that pleased me very much. The Cards beating the Phillies and the Tigers beating the Yankees. Before you call me a Yankee hater or think that I'm just angry because the Phillies are the best team in the NL East, read on. I love the fact that the two teams who are seemingly the best on paper are out of the post season. It once again proves that marquee players and huge salaries do not always win championships. The Phillies have the most daunting pitching staff in baseball. Combine that with the bats of Ryan Howard, Jimmy Rollins and Chase Utley. Then add Hunter Pence at the trade deadline. There was absolutely no way that this team wasn't going to the World Series. In fact, they'd probably win the whole thing. Hmm...just like everyone said last year. What actually makes me happiest about the dismissal of the Phillies goes back to game 162 at Turner Field. There were two very obnoxious Phillies fans sitting right in front me. They turned around to 'chat' quite often. Yes, I think of them, and I smile. As for the Yankees, it's that whole the rich get richer thing. I'm not a Yankees fan. I never have been. I never will be. That said, I have a lot of friends who are die-hard Yankees fans and some of them are very nice people! Here's the disclaimer. I don't like the Yankees as an entity but I do have a certain appreciation for aspects of the organization. I love their history. I love the respect and adoration they have for former players. I remember how sad it was when Thurman Muson died and how fitting the team's tribute was. I'm glad Joe Torre is in the Commissioner's Office. I think Derek Jeter is a classy guy and player. But still, I'm glad the current team is at home watching the post season on tv.